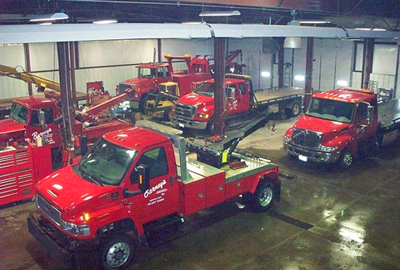 Our fleet of recovery vehicles include a semi tow truck, a medium truck, two flatbeds and a light duty truck. We are located conveniently off I-80 exit 168 and service is available 24 hrs a day. The shop has been expanded with an extra 4000 square foot extension giving us more room to work on large trucks, motorhomes and semi-trucks. We do everything from oil changes, brakes, custom exhaust, to transmission and engine swaps. Foreign cars, diesel trucks, tractors; you name it- we work on it.